There is no better feeling as a marketing director than hearing clients express how thrilled they are with the marketing you’re doing for them. And while I will take this opportunity on behalf of all my colleagues at Mezzanine to say we do hear this quite frequently, it is even nicer to hear when it’s about something that required little effort and was very low budget too. In other words, there are some B2B marketing tactics that require a lot of work, and others that don’t – but deliver great results all the same. 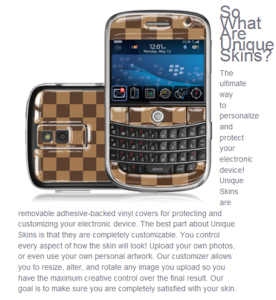 One example of this is branded phone skins. We recently suggested them to a client who has a large employee base frequently out in the field and surrounded by prospects. So, after little convincing they suited up their team with branded smart phones and they looked fantastic. So fantastic that they are frequently the source of great conversation starters and in one case so far, ended up garnering attention from a prospect which turned into a client! So there you have it, an example where you don’t have to spend a great deal on resources or money to get a fantastic return on investment. You just need to have the right B2B marketing plan and some expertise on which tactics will deliver the most impact for your business. Why not give us a call to learn about how our marketing services can help your company reach its goals?